To Phil Goodman and the members of his company, demographics are not as important as strategies based on the psychology of marketing. Some refer to this as Genergraphics®, but it's really keen observations and street-smart experience. And as the acknowledged leader in this discipline, Phil certainly offers a wide array of impressive credentials. He began his deep involvement in advertising and marketing in 1955 and, in 1974, formed Western Media Corporation, a media and marketing firm specializing in the hospitality industry. It was during the mid-1980s that Phil observed a subtle change in consumer media use and spending patterns. His interest increased as these patterns became more distinctly different from traditional ones. On an extremely practical level, Phil uncovered, defined and began to document these differences as early as 1987. In 1995 he opened the Boomer Marketing Research Center in San Diego, followed soon after by Generation Transitional Marketing. Today, Phil Goodman is considered one of the foremost experts on the Baby Boom generation -- the most active group of American consumers, over 77 million strong. Phil has counseled the FOX Television Network, USA Today, The Wall Street Journal, and Hotel/Motel Management Magazine on Boomer marketing. He is also a special consultant to numerous radio, television and print media, as well as a variety of hotel chains and retail accounts. He has also done extensive research for the Ford Motor Company. His book, Boomers: The Ageless Generation, is required reading in many college and university courses. Using research and actual business experiences relating to the Boomer, Phil has defined an entire litany of straightforward, down to earth marketing techniques. Phil's name and quotes are used prolifically throughout the media as the prime source of expert information on Generation Transitional Marketing. His unique ideas appear regularly in many authoritative periodicals, newspaper, and television news programs including "USA Today," "Wall Street Journal," "U. S. News & World Report," "United Press International," "Entrepreneur Magazine," "News Week Magazine," and "Broadcasting, Sales, and Marketing Magazine" among others. He is also an energetic and engaging speaker who has provided keynote addresses for a number of leading organizations including the National Association of Broadcasters Convention, the Independent Television Conference, numerous State Tourism Conferences, the American Hotel Association, USA Today Sales & Marketing, the Island of Bermuda, RCI Timeshare, and Travel Industry of America. 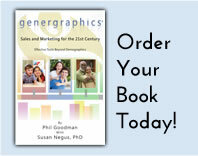 Phil Goodman knows each of the generations in the United States and Genergraphics like no other, and only a rare few in the marketing industry reach the recognized stature that Phil has achieved. Marketing professionals also know when he says something, you can take it to the bank.